We’d love your help. Let us know what’s wrong with this preview of What the Moon Said by Gayle Rosengren. Fans of the Little House books will fall in love with Esther. Thanks to her superstitious mother, Esther knows some tricks for avoiding bad luck: toss salt over your left shoulder, never button your shirt crooked, and avoid black cats. But even luck can't keep her family safe from the Great Depression. When Pa loses his job, Esther's family leaves their comfy Chicago life b Fans of the Little House books will fall in love with Esther. Thanks to her superstitious mother, Esther knows some tricks for avoiding bad luck: toss salt over your left shoulder, never button your shirt crooked, and avoid black cats. But even luck can't keep her family safe from the Great Depression. When Pa loses his job, Esther's family leaves their comfy Chicago life behind for a farm in Wisconsin. To ask other readers questions about What the Moon Said, please sign up. Would this book be good for a middle schooler looking for an interesting and hard to put down book? 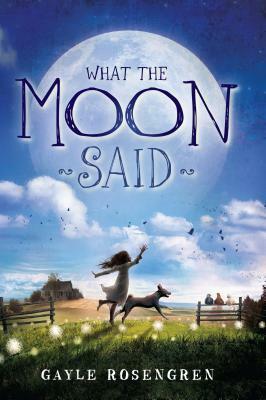 Although I originally read this exquisite and heartwarming novel in 2014, I loved Gail Rosengren's What the Moon Said so much, I adored it so much that I simply have not been able to pen and post a for and to me adequate review. Since the author is also a GR friend, I recently realised that I should really post a review, although I still think that any review I do post, will not even remotely come close to describing how much this book was and still is a pleasure and a joy to read (I have reread Although I originally read this exquisite and heartwarming novel in 2014, I loved Gail Rosengren's What the Moon Said so much, I adored it so much that I simply have not been able to pen and post a for and to me adequate review. Since the author is also a GR friend, I recently realised that I should really post a review, although I still think that any review I do post, will not even remotely come close to describing how much this book was and still is a pleasure and a joy to read (I have reread it at least five times since 2014 and each time, I love and appreciate it even more, and will more than likely continue to do so). Now I think one of the main reasons that I enjoyed What the Moon Said so very much is the fact that the father is German and the mother Russian (or perhaps Russian Mennonite), but that even though the story takes place in 1930's America, there is no "all Germans are evil" presented and shown; it is simply a story about individuals, many of them of German background (and mostly farmers) trying to make ends meet, and how the whole community helps and sustains one another. While I do have some rather huge issues with the mother and her strict and uncompromising ways, I actually also very much appreciate the fact that the author has not shied away from depicting her as a character with faults and problematic, superstitious ideas (and one should indeed remember that the mother does, in fact, apologise and accept that she has made mistakes, and that alone, is worth gold in my opinion). ‘What the Moon Said’ is one of the best books I have read in a long time yet it is for eight to twelve year olds. I found it a beautiful read set in the time of the great depression in America. The main character is little Esther and the themes in the book are centered on this child. Sometimes she is the narrator when for example she describes her bewilderment at some of the painful issues between her Mother and herself. Her Father is American and her Mother is Russian and is fanatical in her superstitious nature. This aspect of her character runs through the whole story causing Esther in particular problems in whether to believe them or not. Little Esther, a dreamy imaginative child lives a dual life. When things are too hard for Esther to bear, she retreats into her private dream world where she can escape from the pain of reality often conversing with her beloved doll. This often gets her into trouble. Esther longs to feel loved by her Mother who spends all of her days working hard to keep her family fed and clothed. Esther cannot seem to sense this love no matter how she tries to please her Mother. She is sure in her heart that she is not good enough to be loved and often makes unfavourable comparisons concerning her Mother’s attitude towards her elder sister and younger brother in contrast to how her Mother treats her. This fear is manifested primarily in her relationship with her superstitious Russian Mother. Esther sees her Mother as someone who is always irritated, disappointed or even angry with her. In her mind she does not have her Mother’s approval, so to escape from this pain she retreats into her imaginary world where her Mother is all loving. She does endure a lot of emotional stress for because of her low self esteem for she herself does make many mistakes in her efforts in general to receive love. Esther doesn’t realise how often her hard pressed Mother is irritated by her own constant day dreaming when she should be doing things her Mother has asked her to do. In the latter part of the book, the harsh conditions during the long hard winter escalates, causing the family and their animals to suffer general hardship. Hunger is their greatest enemy. Food has run out and the family are starving and in desperate need. It is at this point that dramatic events now take place leading to Esther being returned to Chicago to stay with her big sister Julie. It is in this latter part of the book; Esther finally begins to learn the truth about love and the acceptance of reality rather than forever escaping into her imaginary world with her beloved doll to find it. She discovers what it actually means to her alone, rather than having her big sister Julie's explanation. She discovers that love is not just about hugs and kisses. She at last learns that words can be the smallest part of loving. The continuing struggle with the state of affairs on the farm now causes the whole family to have to come back to Chicago. This is where the author ties up all the loose ends to finish the story. Earlier in the book, Esther had longed for her own Mother to give her hugs and kisses in the way her best friend received so many from her own stoic Mother. At the end of the book she learns that her friend’s Mother had left the family to run off with a lover. She might not be so demonstrative and she causes issues with her superstitious nature, but her love for her family shines through all the hard work and dedication in the way she gives her whole life to keeping the family together no matter how hard the choices she has to make. She improvises, no matter what dark clouds of troubles swirl around them. One small issue I do have with the ending is that it feels a little rushed. It is almost as if that now Esther’ problems are ironed out… she isn’t sure where to go next, for Esther is without doubt the major character. This is just my personal impression though and others might not agree with me. I had a constant lump in my throat during most of the second half of the book and found myself fighting tears. I identified with this lonely little girl. She tries so hard to please her Mother as the story unfolds. As a child and into my teens even, I also struggled with my perception of an undemonstrative Mother that I carried inside of me for various personal reasons. I seemed to be a disappointment to her no matter how hard I tried. I recommend this book highly. I enjoyed it as an adult. It would also be ideal to read with your children or to them. Do you know the saying, “Don’t judge a book by its cover?” Well, I totally do that, at least when it comes to actual books. It’s the first thing that draws me to a book, and I have a sneaking suspicion that I’m not alone in this. The cover wouldn’t be so important otherwise, right? Well, when I decided to review a new juvenile book (middle-grade to be exact), I scrolled through all the covers of new releases until this one struck me. The cover was beautiful with the large moon hanging behind the Do you know the saying, “Don’t judge a book by its cover?” Well, I totally do that, at least when it comes to actual books. It’s the first thing that draws me to a book, and I have a sneaking suspicion that I’m not alone in this. The cover wouldn’t be so important otherwise, right? Well, when I decided to review a new juvenile book (middle-grade to be exact), I scrolled through all the covers of new releases until this one struck me. The cover was beautiful with the large moon hanging behind the title, and the little girl and her dog running across it lent a hopeful feeling. The book blurb seemed promising so I gave it a shot. Luckily for me, What the Moon Says was a stunning debut for Gayle Rosengren. When Esther’s father loses his job in the city during the Depression, the family makes a hard move to a farm to try their hand, and luck, at farming and living off the land. The book follows their ups and downs as they discover both the rewards and the heartaches of farm life. Esther’s mother is extremely superstitious and sees signs in almost everything. The book isn’t called What the Moon Says for nothing. Esther’s mother, or Ma as she calls her, dictates many decisions by the current position, shade, and so on, of the moon. Her decisions often set the rest of the family either at ease or at incredible unease. Ma gazed up at the white circle in the bright blue sky. She frowned. “What does it mean, Anna?” Pa asked anxiously. “It means a change is coming,” she said. “A good one or a bad one?” Violet asked. Pa stood silent for a moment. The moon is only the beginning of the superstitions. There’s everything from empty buckets, seeing spiders in the morning, shirts buttoned incorrectly, shoes on a table, and so much more. What I love about the superstitions is how well they were done. It could easily have turned into an annoyance but ended up as an endearing, and often entertaining, aspect of the story. What the Moon Said has strong characters that made me care. Ma is a hard woman; a woman who doles out affection sparingly, and is more affectionate (although, not by much) with Esther’s siblings than she ever is with Esther leading Esther to believe that her mother doesn’t love her. Esther’s heartache over this dilemma completely tore me apart. While there were times that I grew tired of hearing about her fear that Ma didn’t love her (because it is said a whole heck of a lot), I also understand that children are really capable of honing in on one subject and drilling it into the ground (I know mine do). In other words, Esther’s fear is believable. An outstanding MG novel that I'm sure will become a favorite of students and teachers alike. I was completely captivated by this historical fiction novel, which takes place during the Depression. Esther is a young girl struggling to get her mom's approval and love. Her mom is very superstitious and these superstitions guide Esther's enter family, determining the good luck and bad luck they'll have. At times, it's frustrating, hurtful, and confusing for Esther, especially when she is forbidden to An outstanding MG novel that I'm sure will become a favorite of students and teachers alike. I was completely captivated by this historical fiction novel, which takes place during the Depression. Esther is a young girl struggling to get her mom's approval and love. Her mom is very superstitious and these superstitions guide Esther's enter family, determining the good luck and bad luck they'll have. At times, it's frustrating, hurtful, and confusing for Esther, especially when she is forbidden to play with a girl she really likes as a friend. Readers will move with Esther and her family from Chicago to a farm in Milwaukee. They'll experience hunger, they'll celebrate the holidays with them, they'll go through Esther's illness and recovery. Even though the novel takes place a good eighty years ago, readers will be able to relate to the characters. Family, friendship, and being neighborly are some of the bigger themes of this novel. It'll has a timeless appeal like Little Women and Little House on the Prairie. This MG novel is a winner! What The Moon Said is to me, a story about the real meaning of love. All through their challenges during the great recession, Esther tried over and over to make her mother show her that she loves her. She wanted her mother to hug her and tell her she loves her. In the end, after many hardships and tears and painful moments she realized things are never white or black. I lost count of all the many moments I saw similarities between Esther's life and my own childhood. Some of them are too personal t What The Moon Said is to me, a story about the real meaning of love. I lost count of all the many moments I saw similarities between Esther's life and my own childhood. Some of them are too personal to share on the internet. Others have a bittersweet taste like I remember making cones out of old newspapers as a kid so I could go sell roasted peanuts during summer breaks with my cousins. Esther's family went through a lot and her mother's superstition didn't help much. However I loved that even the mother had to learn the hard way that sometimes signs could be wrong or better yet they could mean nothing at all. I love that this book showed in a vivid and poignant way that maybe real love is to stick together when life get rough, when life gets so gloom and dark and hopeless that you can only hope to make it till tomorrow, and maybe the day after and so on. This is a quiet book but a very powerful one. It teaches a lot of lessons but not in a preachy way. You see everything Esther feels. You are right there in her thoughts. You struggle with her over what decision is the right one. You get angry with her when she fails over and over to make her mother see her when she's doing good things, great things, and not when she messes up. I remembered all those feelings and I was shocked at how raw some of them still were, after so many years. This book needs to get into the hands of every kid. A ring around the moon is an omen of bad things to come. Ten-year-old Esther doesn’t know whether or not she believes her Ma’s superstitions, but the moon’s warning seems to come true when her father loses his job in Chicago. The year is 1930 and the nation is in the grip of the Great Depression. City jobs are impossible to find. Esther and her family move to a ramshackle farm in Wisconsin to eke a living out of the land. There is no electricity or plumbing, but Esther is excited about the move. A ring around the moon is an omen of bad things to come. Ten-year-old Esther doesn’t know whether or not she believes her Ma’s superstitions, but the moon’s warning seems to come true when her father loses his job in Chicago. The year is 1930 and the nation is in the grip of the Great Depression. City jobs are impossible to find. Esther and her family move to a ramshackle farm in Wisconsin to eke a living out of the land. There is no electricity or plumbing, but Esther is excited about the move. There are horses and cows and, best of all, a dog. Not wanting to bring more misfortune, Esther does her best to follow her Ma’s rules. But life is not simple when a sign of bad luck means that Esther must turn her back on the only friend she has. Esther is caught between loyalty to her Ma and her own heart, all while trying to survive the harsh Wisconsin winter. So bittersweet! I want to give Esther a hug...no, not just one hug...ALL THE HUGS! Knowing that Esther's book is based on the real experiences of author's mother made the story events hit so much closer. And I love the ending. Without giving away too much, it's hopeful but realistic. I'd recommend this book to fans of the "Little House on the Prairie" series. What a perfect historical fiction middle-grade novel--it is right on the nose for about age 8-10, the perfect next step for children who have outgrown books like Mary Pope Osborne's Magic Tree House series. This will greatly appeal to fans of the Little House in the Big Woods series. I love the chapter heading art by Jonathan Bean ("Building Our House"). Lends itself to so many educational extension activities--sure to become a great favorite of teachers and homeschooling families. This story combines the best of a classic vignette-based tale with elements seldom found in books for this age. Set in an early year of the depression, it spans life in a Chicago apartment and a rural SE Wisconsin farm community. Esther deals with some self-inflicted angst about not being loved as much as her siblings, but also faces the power and fears conveyed by her mother's strict adherence to old world superstitions. Throughout it all she takes tentative steps toward maturity, gaining persp This story combines the best of a classic vignette-based tale with elements seldom found in books for this age. Set in an early year of the depression, it spans life in a Chicago apartment and a rural SE Wisconsin farm community. Esther deals with some self-inflicted angst about not being loved as much as her siblings, but also faces the power and fears conveyed by her mother's strict adherence to old world superstitions. Throughout it all she takes tentative steps toward maturity, gaining perspective and appreciation for her family. I think it was a wonderful. The book was placed in the Depression, and Esther, the main character, is trying to make her mother love her with hugs and kisses. But Esther does not understand what real love is and what her mother is doing to love her, which is being kind and considerate and patient. Along the way, she finds out what real love is. Esther is a sensitive endearing heroine in this beautiful piece of historical fiction. Not just an exploration of a time and place, but of a way of perceiving the world. Once ensconced with Esther, through good times and bad, I didn't want to leave her side. Completely adorable. If you are a fan of the Little House books, you MUST read Rosengren's debut. You'll love Esther's adventures in depression-era Wisconsin! I received a copy of this book as part of a Goodreads giveaway in exchange for an honest review. This book is definitely geared towards the middle grade demographic. Although I have not read a lot of stories for this age group I thought this was a really cute read. It takes place during the depression so it has the historical fiction aspect that I love in my reads. It gives the opportunity to educate young readers about the time in a way that they do not really realise they are learning something. This story was written in a way that there were no real bad people in the story. Through Esther the reader goes on a journey of life changes and learning to accept things the way they are. This is a story about family and love and growing up. If I had to choose one word to describe this book it would be "kind." Esther wants so much for her mother to tell her she loves her, but Ma is not the demonstrative type. And Esther's journey is to learn that love is expressed in many ways. Great for a snuggle in bed read aloud, as well as an accurate portrait of the struggles of an immigrant family during the Depression. Loved all the historical details of life in Chicago and life on a Wisconsin farm from the point of view of 11-year-old Esther. Favorite quote: "Home was more than a place. Home was family." I really enjoyed this book! I was considering this book for my tween book club, and after reading it, I think it would be a excellent choice. Esther Vogels is a young girl living in Chicago in the year 1930, during the Great Depression. Esther and her older sister, Violet, spend their free time enjoying going to the movies and playing like normal children. They realize so many people are suffering during this time, but their father has a good job, and everything seems fine. Their mother, wisely p I really enjoyed this book! I was considering this book for my tween book club, and after reading it, I think it would be a excellent choice. Esther Vogels is a young girl living in Chicago in the year 1930, during the Great Depression. Esther and her older sister, Violet, spend their free time enjoying going to the movies and playing like normal children. They realize so many people are suffering during this time, but their father has a good job, and everything seems fine. Their mother, wisely planned ahead and did make cut backs in case of the the hard times falling onto the Vogels. Ma is superstitious and sees a bad sign in the moon. Then Pa loses his job, and the family makes a tough decision. They leave their apartment in the city and buy an old farm in Wisconsin. The oldest sister, Kate, is married and stays in the city. Julia, the next oldest stays with her, leaving the three youngest children, Violet, Esther, and Walter to move to the farm. Esther finds a dog, Mickey, left by the previous owners and surprisingly is allowed to keep him! When I first picked up the book, I thought it would be more about the depression, but in actuality it is a story of a young girl trying desperately to obtain her mother's love and affection. Ma is from Russia, and her beliefs in superstitions control her life. I will be honest.....I hated Ma. I understand her position, especially when we learn her story and why she is the way she is now. I just felt she was downright nasty to Esther. She did not treat the other children as harshly as Esther, which made Esther feel unloved and unwanted by her mother. She spends the whole book trying to be a good girl and win her mother's affection. This was heartbreaking to me. I wanted to reach through the book and slap the mother, reminding her she had five children, and she should learn to treat them equally. Readers do learn why she is the hardest on Esther, which I do understand her fears, I felt it did not give her the right to be so cold to her daughter. Her superstitions constantly were confusing and hurting Esther, especially when she was forbidden to play with Bethany, the only girl that really befriended her. Without giving away the story, I will add this much...Esther does learn a very valuable lesson about love. She realizes it comes in all forms. In the beginning of the book she had on ideal image as to what her mother should be, basing it on Mrs. Rubenstein, her city friend's mother. She thinks her mother should be like Mrs. Rubenstein and eventually realizes love shows itself in many forms. As an adult reader you can tell that Ma loves Esther very much, but has trouble showing her. It's 1930 in Chicago, Esther has been living here with her Ma, Pa, and sisters and brothers. When the Great Depression hits, everyone is losing their jobs, Pa included. The Vogel family decide to move to a farm in Wisconsin thinking they can make a fresh start leaving two of the daughters behind. Country life turns out to be disappointing as the farm turns out to be more challenging then they thought, it has an outhouse, there's no ice box or electricity and tending to the animals and crops is h It's 1930 in Chicago, Esther has been living here with her Ma, Pa, and sisters and brothers. When the Great Depression hits, everyone is losing their jobs, Pa included. The Vogel family decide to move to a farm in Wisconsin thinking they can make a fresh start leaving two of the daughters behind. Country life turns out to be disappointing as the farm turns out to be more challenging then they thought, it has an outhouse, there's no ice box or electricity and tending to the animals and crops is hard work. Esther is eager to take on the challenge, she wants to prove to Ma that she can be worthy of her love by helping out and make her proud of her. Maybe then Ma will show her the same affection as her friend Shirley's mom does. Ma was born in Russia and therefore has many superstitions and signs that she believes in. Spider's before breakfast means good luck, buttoning a shirt incorrectly or putting your shoes on a table are bad luck. Ma's signs guide her, but sometimes her signs interfere, especially when Ma says Esther can't be friends with Bethany because she has a mole on her face that makes her "marked" or dangerous. Esther’s Ma pays attention to a lot of signs to keep her family safe. Frequent occurrences, like seeing a ring around the moon or a spider before breakfast, have to be analyzed to determine whether they will bring good luck or bad. And when it comes to Ma, Esther feels like she always needs good luck. The family lives in Chicago at the start of the Great Depression, but when Pa loses his job, they all move to a farm in Wisconsin. The place is run-down, has no electricity or indoor plumbing, and r Esther’s Ma pays attention to a lot of signs to keep her family safe. Frequent occurrences, like seeing a ring around the moon or a spider before breakfast, have to be analyzed to determine whether they will bring good luck or bad. And when it comes to Ma, Esther feels like she always needs good luck. The family lives in Chicago at the start of the Great Depression, but when Pa loses his job, they all move to a farm in Wisconsin. The place is run-down, has no electricity or indoor plumbing, and requires lots of hard work, but Esther finds joy in country life. She doesn’t understand why Ma is always looking for signs to help direct their lives, but Esther is also looking for signs—actions that will tell her that Ma truly loves her even though she always seems to be messing up. 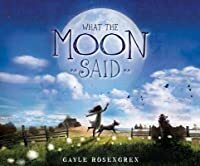 What the Moon Said by Gayle Rosengren is fun to read because Esther’s voice is innocent, hopeful, and trusting. She wants to believe her mother loves her, buy Ma is not one to show her emotions outwardly. Always focused on the tasks at hand, she doesn’t take time for hugs and kisses. It’s not until Esther experiences a few setbacks and begins to see the faults in other lives she thought were perfect, that she truly sees how Ma shows love. Esther is lively, thoughtful, considerate, and wholly irresistible. You’ll fall in love with her as she struggles to understand the people in her own family as well as the world around her. I highly recommend What the Moon Said for mother-daughter book clubs with girls aged 8 to 12. Well, I finished it and I am still trying to figure out why I found the book a bit more problematic than I expected. One of my Goodreads friends described it as being like Anne of Green Gables, only about the Depression era. I guess one of the things that troubles me about this - and perhaps my respect for Anne of Green Gables colored my perception of this book - was that Anne was continually striving to be honest and good. She had trouble measuring up, but she was usually completely honest abou Well, I finished it and I am still trying to figure out why I found the book a bit more problematic than I expected. One of my Goodreads friends described it as being like Anne of Green Gables, only about the Depression era. I guess one of the things that troubles me about this - and perhaps my respect for Anne of Green Gables colored my perception of this book - was that Anne was continually striving to be honest and good. She had trouble measuring up, but she was usually completely honest about her failures. In this book, I got the feeling that various characters were excusing their failures. Esther goes against her mother's explicit instructions to not be a friend to Bethany - and makes excuses for her failure to obey her mother. Her mother, in turn, only changes her mind about Bethany, because she saved Esther's life. She didn't really change her mind about the superstitions. The final realization about love and family is wonderful, but it felt a bit hollow to me. I expected the revelation about Tatiana, but it came so late in the book that, while it provided explanation, it didn't provide redemption for some of the things the mother had done. Esther Vogel lives in Chicago during the early part of the Great Depression with her Russian immigrant parents and sisters. Life is good with movie serials, ice cream shops, and her friend, Shirley, but Esther wishes her mother was more affectionate like Shirley's mother, instead of being so superstitious about everything. However, her mother's beliefs about the ring around the moon bringing bad luck do come true and Esther's father loses his job. Pa and Ma decide use the money they have saved f Esther Vogel lives in Chicago during the early part of the Great Depression with her Russian immigrant parents and sisters. Life is good with movie serials, ice cream shops, and her friend, Shirley, but Esther wishes her mother was more affectionate like Shirley's mother, instead of being so superstitious about everything. However, her mother's beliefs about the ring around the moon bringing bad luck do come true and Esther's father loses his job. Pa and Ma decide use the money they have saved for a house to buy a farm in Wisconsin instead, but Ma has a dream where there is rain, and rain before a journey is a bad omen. The farm is hard work but Esther loves the animals,the idea of being pioneers, and at school meets Bethany, who Esther's mother forbids her to be with because Bethany is marked on her face with--a mole. The mother/daughter relationship,in Esther's mind, is strained even more now because of superstitions. It takes an illness and a move back to Chicago for Esther to finally learn the depth of her mother's love. Esther loves living in Chicago. It's the Depression but her hard working immigrant parents have provided a warm and safe home for their family of seven. Pa works hard at Zeigler's Laundry to provide for the family and Ma guides them with firm no nonsense wisdom and a large dose of the superstitions she learned in her homeland of Russia. But Pa looses his job and the family makes the hard decision to move to a farm in Wisconsin where they think life will be more sure. Soon our cheerful and bright Esther loves living in Chicago. It's the Depression but her hard working immigrant parents have provided a warm and safe home for their family of seven. Pa works hard at Zeigler's Laundry to provide for the family and Ma guides them with firm no nonsense wisdom and a large dose of the superstitions she learned in her homeland of Russia. But Pa looses his job and the family makes the hard decision to move to a farm in Wisconsin where they think life will be more sure. Soon our cheerful and bright Esther is loving living like a pioneer especially when she can have the dog and horse she has always dreamed of. Esther yearns for her mother's approval and affection. But Ma does not kiss and seldom gives hugs and Esther thinks this may mean she doesn't love her. Your heart will ache for Esther as she bungles many attempts to receive these signs of affection. She doesn't change her mother but she will learn that love is actions more than words. Written in a perfect voice for middle grade readers the book will appeal to those who love the Little House books and would be great for classroom discussion. How do we tell the difference between superstition and accepting life as it is? Esther struggles with this question as we all do. We all want to step over the crack or throw salt over our shoulder now and then, "just to be sure" and then we have something besides life itself or ourselves to blame when things go wrong. The contrast between employment opportunities during the Depression and today would be an interesting talking point with youngsters. I wonder if children of unemployed parents would How do we tell the difference between superstition and accepting life as it is? Esther struggles with this question as we all do. We all want to step over the crack or throw salt over our shoulder now and then, "just to be sure" and then we have something besides life itself or ourselves to blame when things go wrong. The contrast between employment opportunities during the Depression and today would be an interesting talking point with youngsters. I wonder if children of unemployed parents would be able to relate to Esther's family. I like that not everything in this story had a happy ending as Esther had consequences for her actions. Her suffering is an example that life goes on and there can still be love in a family. Many children may relate to her questions about a parent's love and how it is displayed. I thought there was going to be a different connection between Esther and Tatiana, so this brought suspense into the story. I think this would be a good read aloud! Gayle Rosengren has drawn from her family's history during the Great Depression to write this sweet, tender, realistic story about a girl's struggle with her relationship with her mother and dealing with change in circumstances. The characters are well-drawn and, as a reader, I loved this family. [Warning: it's a two-hanky read.] The immigrant mother's superstitions were fascinating in how they affected decisions and created dilemmas for this family. The language and content make this story acce Gayle Rosengren has drawn from her family's history during the Great Depression to write this sweet, tender, realistic story about a girl's struggle with her relationship with her mother and dealing with change in circumstances. The characters are well-drawn and, as a reader, I loved this family. [Warning: it's a two-hanky read.] The immigrant mother's superstitions were fascinating in how they affected decisions and created dilemmas for this family. The language and content make this story accessable to advanced second grade readers, or would be the perfect read-aloud book for teachers in elementary classrooms. Growing up in the early years of the Great Depression is hard for Esther. Her parents, both immigrants, decide to buy a farm in Wisconsin and leave Chicago behind. Esther makes the best of the move, accepting their new farm, out-dated house, and hard work. She also tries to understand her mother and does everything she can to earn her mother's affection. The story traces the ups and downs of Esther's determination to help her family, make friends, and do her best in school. Recommended for grade Growing up in the early years of the Great Depression is hard for Esther. Her parents, both immigrants, decide to buy a farm in Wisconsin and leave Chicago behind. Esther makes the best of the move, accepting their new farm, out-dated house, and hard work. She also tries to understand her mother and does everything she can to earn her mother's affection. The story traces the ups and downs of Esther's determination to help her family, make friends, and do her best in school. I so loved this book. Every time when something bad happened in the story, I would think, "Oh, I wish the author wouldn't turn the story this way." But then the author wrote the lesson to be learned or the good that came the family's way, I would then think, "I loved the way this story turned out to be." The story was well-thought out. The story of this family made you appreciate what you had, but of course, the main character, Esther, learned the same thing. I fell in love with Esther from the moment she heeds her mothers warning. One can't be too careful when there's a ring around the moon! From this start, we find Esther navigating a very real, at times, harsh world filled with conflicting messages and so many things to remember! It is a coming of age tale for young girls who we hope learn, like Esther, to listen to their heart, consult their minds and find a true awakening to their beautiful individual being. Loved this book.